Today, British celebrity chef Jamie Oliver’s campaign, Food Revolution, kicks off in 10 countries across the world. In what he calls a global day of celebration, Oliver is hoping to get people to think about the world health crisis by raising awareness, sparking discussions, and inspiring people to bring about a change in the way they approach food and nutrition. The campaign focuses on children and the need for a robust and fun food education system. On his website, Oliver points out that “millions of kids are eating too much of the wrong food, while millions more don’t get enough of the good stuff to let them grow and thrive. We need to unite as one strong, single voice to force governments and businesses to create a healthier, happier world for the future.” In India, chef Kunal Kapur and actor Jacqueline Fernandez will be cooking live on Facebook from Pali Village Café in Bandra. Tell us the idea behind Food Revolution. What is new this year? The Food Revolution is my attempt to create a worldwide campaign to discuss, debate and adopt a healthier way of eating. The statistics, especially concerning children, are startling and this makes me scared about global health. 159 million children are too undernourished to grow properly, whereas 41 million children under the age of five are overweight. I have been campaigning for healthier food and better education about nutrition for 15 years now. One of the first TV shows I created in 2010 was called Food Revolution. It was centered on reforming school lunches in US schools and also trying to create a conversation about healthy food and nutrition in America. This year the Food Revolution is taking place on a huge scale with 10 countries involved in the campaign, in an attempt to spread the conversation to a global audience. It kick-starts on May 20 with live-streaming on my Facebook page. I cook healthy meals, provide advice and of course have lots of fun. The live-streaming makes this an interactive medium where people from different countries can be a part of the Food Revolution. And the best thing is that I have some of the best chefs and best known personalities coming on board, teaching people watching them in their countries just how easy and inexpensive it is to make nutritious food. The campaign will then continue in Australia, India, Germany, Netherlands, Brazil, USA, Kenya, Tanzania, Canada and Nigeria. This is the first time you are officially doing something in India for the Food Revolution. What can we expect? Being British, I can safely say that Indian food has influenced my palette. The British love Indian food precisely for the reasons it is famous for. It’s wholesome, fresh and delicious. My blog is filled with Indian recipes! Therefore, I really feel a connection to India and I am so glad the Food Revolution has spread to India. I want people to be better educated about food. In a country like India, which has the world’s youngest population and where starvation and obesity exist simultaneously, it is important that people are made aware about how our diet impacts our daily life. In India, the government is trying to reduce the number of malnourished children by launching initiatives like Infant and Young Child Feelings Counselling Centres in certain states. At the same time, it is beginning to tackle the obesity crisis by raising awareness of the negative impact that poor dietary and lifestyle choices can have on health, with programmes like the National Programme for Prevention and Control of Cancer Diabetes, Cardiovascular Diseases and Stroke. However, still more can be done. I’m also looking forward to one of India’s top chefs, Kunal Kapur, cooking with actress Jacqueline Fernandez to show the audience just how fun and easy cooking can be. Food Revolution is a massive online campaign. Tell us about running the campaign through social media. The live-streaming feature makes the entire event interactive and inclusive to a global audience, through a virtual medium. But even prior to this event we have constantly used the support of social media to get our message of healthy eating out there. We have started a petition to include practical cooking for school children and people all around the world have signed it and most importantly shared the petition for others to sign. The world is now at our fingertips and social media helps in uniting everyone especially for important causes like global health. With our Food Revolution Day website anyone will be able to access information regarding the campaign and we hope the #FoodRevolutionDay trends worldwide to spread the importance of eating healthy around the world. At a time when people are increasingly obsessed with food, we are also increasingly spending less time making our food. It’s a trend we are seeing in urban India as well. How does one start to bring change then? The Food Revolution is an initiative wherein we use our buying power as consumers to take a stand against unhealthy practices. As consumers we have the power to make a lot of change in the food industry. Many people believe that healthy food is more expensive than junk fast food. We help clarify these myths. That is why it is important to start this discussion so people can debate, ask questions and become more aware. We especially encourage parents and schools to adopt healthier eating habits so it can impact their children’s lives for the better. Small steps like cooking with your children, reading up current issues about the food industry can come a long way in educating your child about nutrition. By adopting a healthy lifestyle you are allowing future generations to access, consume and understand food better than we ever could. That is why a campaign like Food Revolution is important as it encourages better food education. One of the campaigns you actively advocate is involving kids in food appreciation. Tell us about the importance of food education for children. Like I said our children are our future, and with India’s having the world’s youngest population. the youth are fundamental to India’s growth as a nation. To better educate them about food means to better education future generations to come. It is essentially to adopt a healthy eating lifestyle early and at the same time ensure that the kids are excited and eager to learn more about food. The Kitchen Garden is a program I started that teaches school children how to plant a seed and eventually cook a meal with the ingredients they have grown. Whether you are a teacher or a parent inspire your children to love food. Becoming a good food advocate is especially critical as a climate adaption method. How far do you think campaigns such as Food Revolution Day help people think about how their food is grown? Campaigns such as Food Revolution Day are based on accessing and using fresh, local produce. That is why campaigns such as Kitchen Garden help children to learn and think about how their food is grown and what they are putting into their body. One of the most important campaigns I have worked on is the Ministry of Food Campaign. It aims to keep cooking skills alive as it has been proven that cooking from scratch has many healthy benefits to your eating habits. Through a national network of food advisers and cooking teachers we help make the public make better choices about food and nutrition. Being a food advocate means imparting your knowledge and allowing people a chance at a better food education, which is what the Food Revolution campaign aims to do. As a chef, how do you ensure a transparent supply chain for the food you cook with? Sales of organic and more responsibly produced food are on the rise, and like anything, if we demand more, more will become widely available. I find it impossible to be 100 per cent organic, but I do trade up whenever I can. When we trade up to organic meat, it will be more expensive, but really this change is to instigate the habit of eating less meat, and choosing the best when you do. It’s all about quality over quantity. When you buy organic meat you are also ensuring the animal has led a good life before this and that’s what it is important to me. We have to be ethical and compassionate in our food industry. At the same time if they have lived longer you are eating a healthier bird! You are reducing the fertilisers and chemicals you are ingesting. I also love growing my own food. Therefore I adopt these principles as far as I can. 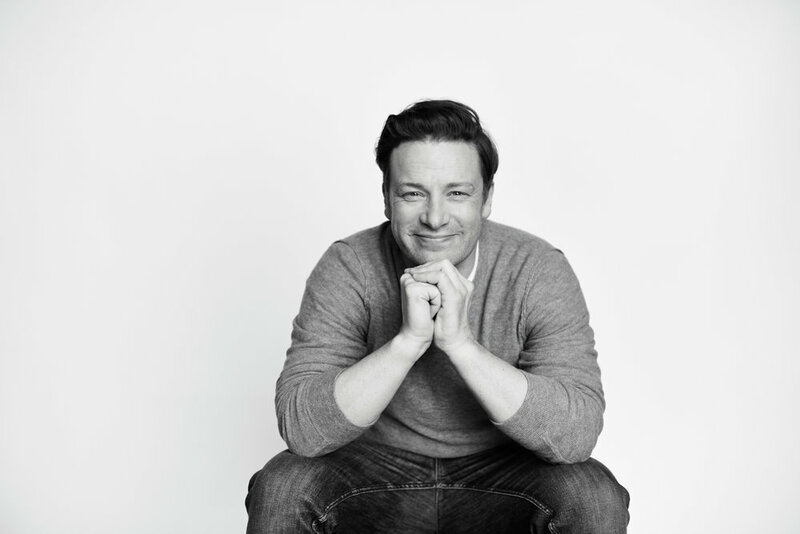 Do we expect to see more of Jamie Oliver in India? I hope now that we have introduced the Food Revolution Day in India it will never stop. We will ensure that the fight for healthy eating continues and hopefully India will continue the campaign. I do also of course have my restaurant Jamie’s Italian in Delhi so a piece of me is already there! Chef Kunal Kapur and Jacqueline Fernandez will be cooking live on Facebook today at 3.30pm.